Commuters go nowhere fast | What Car? City-centre commuters spend an average of 25 minutes not moving for every hour driven. Research by Citroen has found that the time spent stationary has increased by an average of 10.9% over the past two years. 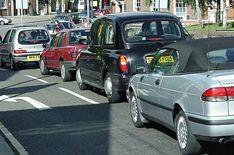 The study looked at commutes in five different cities across Britain. Drivers in Cardiff spend most time going nowhere, with an average of 30 minutes and 46 seconds not moving for every hour driven. Londoners are likely to spend 24 minutes and six seconds stationary. Commuters in Norwich are better off, spending 21 minutes and 20 seconds not moving on an hour-long journey.